Salt City recommends the Chemex if you have 2 or more coffee drinkers in your household! Step 1: Get into the grind. Tip: On all brewers except the pint size model, the ‘button’ indicates the carafe is half filled and the bottom of the wooden collar/spout indicates it’s full. On the pint size brewer, the button is the full marker. Step 4: Let it bloom. Pour a small amount of water over the coffee grounds to wet them, and wait for about 30 seconds for them to ‘bloom’, releasing the most desirable coffee elements from the grounds. 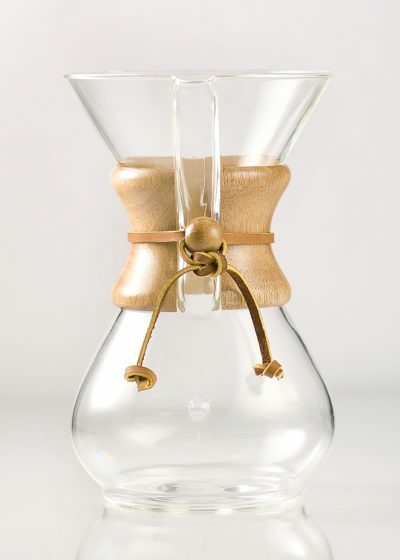 After the grounds bloom, slowly pour the brewing water over the grounds while keeping the water level well below the top of the Chemex (quarter inch or more). Step 7: Toss the filter. Step 8: Enjoy the perfect cup.